Crowdfunding – Make it fast and easy. Make it AGILE. You want to contribute to new technologies, but you don’t know where to start? You want to be the pioneer in your sector and get ahead of the competition? Great news! You can do all that with AGILE. We have developed a maker-friendly IoT gateway that will help get you to the forefront of IoT communications. This open source device has huge potential and you can now get one by supporting our Kickstarter campaign – but be quick, the campaign is only on for the month of November 2017. Imagine being able to manage all your IoT devices from one place. The AGILE gateway helps you do that. With it you will be able to access and manage to your data locally, or send it to the cloud to check and share it wherever you are in the world! Still not convinced? What if we told you that the most ambitious makers will also have the opportunity to create and run their own IoT apps through our visual environment and share them with the rest of our community!? If you are getting started in the IoT world, you may think that this is not for you, since everything seems technical and complicated. Don’t worry, AGILE software can be auto-configured and adapted based on the hardware so that the entire setup is performed automatically for you! Forget about wiring, make it fast and easy, make it AGILE. Do you want to take part in this wireless IoT movement? Join us in our Kickstarter campaign and acquire one of the IoT gateways. Influence the future of IoT thanks to this small contribution! The makers’ world is constantly moving, with various contributors, new creations, new development technologies, and in some cases, smarter devices that improve our daily lives. Crowdfunding campaigns help bring these ideas to life. They are created to help those without enough resources to make their ideas progress and make them successful. This isn’t always an easy path. Reaching an overwhelming victory depends solely on the supporters. Despite the risk, we, the AGILE consortium members are launching this Kickstarter campaign! Our objective isn’t to fund the project itself, but to bring the Internet of Things (IoT) closer to the makers with the AGILE platform. We aim to put forth a solution that encompasses most of the IoT aspects on the market to impact the future of IoT. What are the goals of this open source project and its Kickstarter campaign? 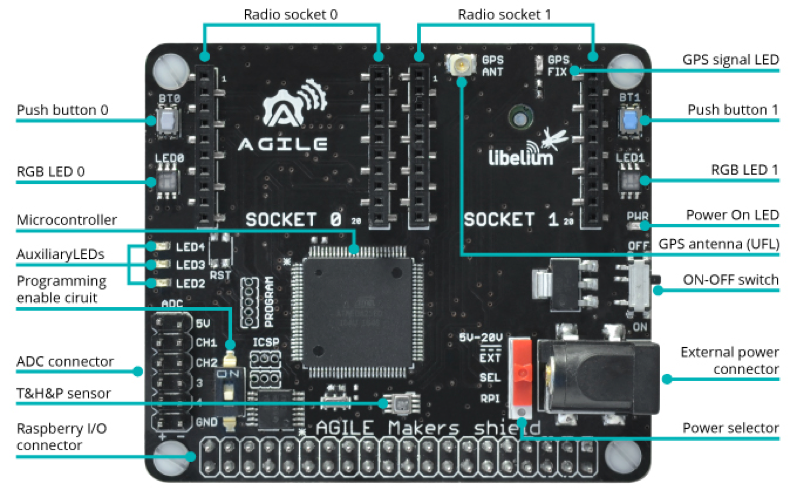 They are simple and clear: to give the world the opportunity to get AGILE started with the IoT gateway, along with all the developed features that you will be able to find on GitHub. It is not a matter of money, we only need 2300€ to launch this Kickstarter! Not that much for a crowdfunding campaign. We simply want our shield to spread among makers! In fact, all these bundles are offered at cost price, so this is a great opportunity. Grab it while the units last! Why do I need the AGILE shield? You will get to use AGILE technology. This small shield will give you great possibilities. The usage and combinations only depends on your needs and creativity! That is awesome! The easiest and fastest way to contribute is supporting our Kickstarter campaign by the end of November 2017. Would you like to help us a bit more? You can also contribute with your time by spreading the word. Follow us on our different social networks and share our updates! If you want to receive updates regarding our progress, software releases, case studies… You can also subscribe to the AGILE Newsletter.